I read a lot of books and I am thankful to the many publishers who send me free books to read and review. I read about 70 or so books a year. That is terribly nerdy, I know. I just realized that I haven't watched television in 8 years. That would be how I have the time to read. I am always telling Denbigh of the grand insights I learn. He just smiles at me. Finally, I picked up a book he would love for me to read. 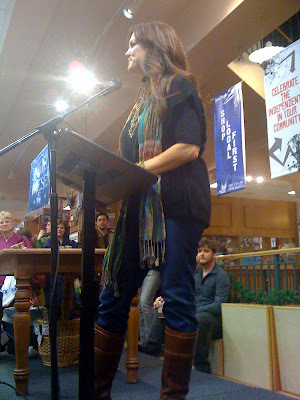 Yesterday, we had the chance to meet The Pioneer Woman, Ree Drummond, at Book People in Austin. She was a delight to listen to. I was amazed at how humble and nervous she was. Denbigh was salivating as he flipped through the pages of her book. I am going to attempt to cook through it over the next few months as a way to minister to him. It should prove to be fun! Ask me mid-January what I think of the recipes. 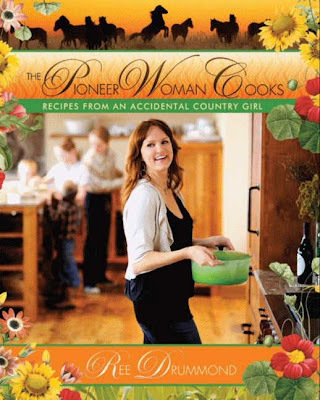 I like how she took a new spin on the cook book with much photography and story telling. You did a fabulous job, Ree! Book People is a grand store if you ever get a chance to go. I had not been in there since they were in a tiny one room building. This thing is spectacular! I want to go back when the place isn't swarming with food crazed women. It was insane! Women were yelling at each other for blocking their view. I think Denbigh was a little scared. I think there were only 4 men in a room of hundreds of women. The book looks great! Get to cooking. You got to meet her??!! Her roast recipe is FABULOUS! I just love her blog...very entertaining. I may have to get that book!! FUN!